When you buy fresh scallops, what you are getting is actually the large abductor muscle, which the scallop uses to open and close its shell. There are several different varieties of scallops. Calico scallops are tiny, about the size of the tip of your finger; sea scallops are large, about the size of a marshmallow, and bay scallops fall somewhere in between. Scallops are fairly easy to prepare, with some recipes calling for them to be first soaked in milk. Soaking scallops in milk is a way to tenderize them and remove any fishy odor. Purchase fresh scallops from a reputable seller. Notice if the seller and employees are practicing safe seafood handling techniques to avoid contracting any food-borne illnesses. Check to see that the scallops are stored on a bed of non-melting ice or are refrigerated. 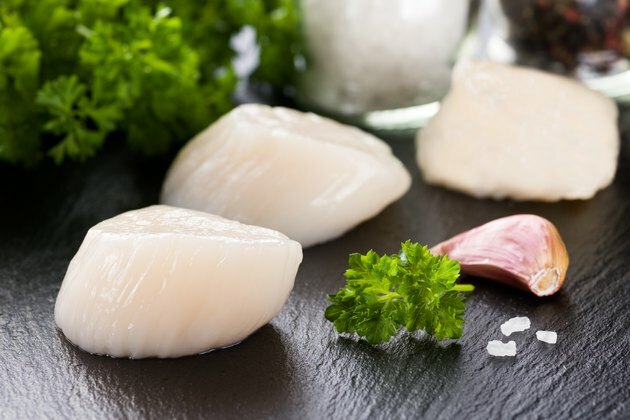 Fresh scallops should smell sweet and fresh; they should appear moist and opaque white with no browned edges. Store your scallops properly if you aren't going to use them right away. The FDA states you can store them in the refrigerator for two days; if you aren't going to use them within two days, store them in the freezer. Prepare your scallops for soaking in milk. Some fresh scallops may still have a "hinge" on the side that is part of the abductor muscle, which is rather tough and chewy. "The Joy of Cooking" recommends cutting off the hinge with a paring knife, then placing the scallops in a colander to rinse them several times with cold water to remove any residual sand. Select a small, clean bowl or dish for soaking the scallops. Select a bowl or dish that is large enough to hold all of the scallops and deep enough that they can all be covered with milk. After rinsing, place the scallops in the bowl or dish and pour enough milk over them to cover completely. Cover the bowl, and place it in the refrigerator. Allow them to soak for one hour. Remove the scallops from milk. Cook them according to your recipe instructions. If you wish to cook the scallops with a coating, dredge them in flour and breadcrumbs after soaking. The milk will help the coating adhere to the scallops. Scallops can be baked, broiled, fried or sauteed until they appear firm and white. Scallops become rubbery and tough when overcooked; "The Joy of Cooking" recommends never cooking them for more than six to eight minutes. A variation of this technique is to follow the steps above, soaking the scallops in coconut milk for 10 minutes before cooking to sweeten them.